Ruben Soto gives us an insightful and informative history of the leading Spanish-language television network in the United States. 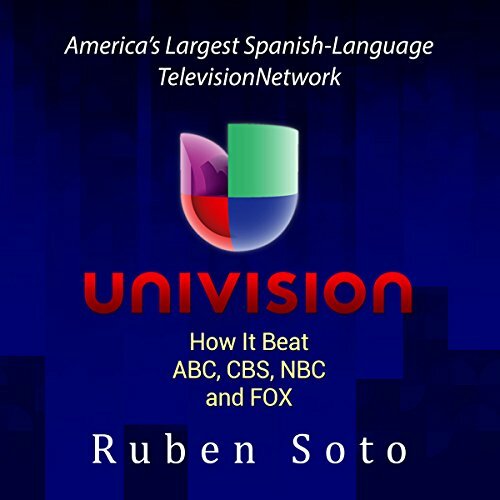 This book will show you how Univision changed American television from an all English-format to one that includes Spanish. You will also hear how Univision convinced advertisers that Hispanics had huge purchasing power. Univision created many celebrities such as Don Francisco, Cristina Saralegui, Jorge Ramos, Maria Elena Salinas, Teresa Rodriguez, Myrka Dellanos, Maria Celeste, Barbara Bermudo, Pamela Silva Conde, Lili Estefan, Raul de Molina, Rodner Figueroa, and many more who became household names in the Hispanic community. Spanish-language television has grown immensely in the United States due to Univision's popularity and to the growing Hispanic population in the United States. The Hispanic population in the US is estimated to be over 50 million with a purchasing power of $1.5 trillion. Hispanics enjoy watching television, and Univision continues to be the most popular Spanish-language television network in the country. If you have any questions about this product by Ruben B. Soto, contact us by completing and submitting the form below. If you are looking for a specif part number, please include it with your message.